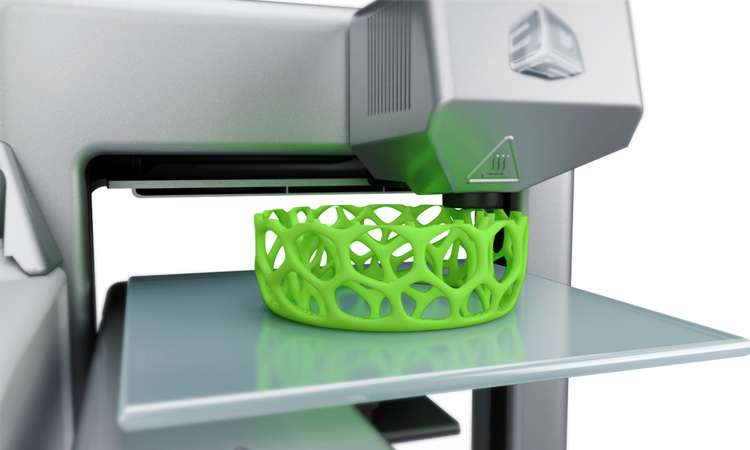 3D printing is a process of creating three dimensional solid objects from a digital design. In this process material such as liquid molecules or powder grains is joined/fused/solidified together under computer control to create a 3D object. Basically, it is a process of depositing a binder material or binding agent (substance/ material that holds or draws other materials together) onto a powder bed with inkjet printer head layer by layer. 3D printing follows additive manufacturing process, so it can substitute the traditional subtractive manufacturing process in which metal or plastic were cut out / hollowed into pieces, for example a milling machine. 3D printing facilitates one to create complex shapes without using more material than those traditional manufacturing methods. 3D printing is useful for both Additive Manufacturing (AM) and Rapid Prototyping. It we help the student to keeping up with new technologies and also it will make them aware of current industrial and commercial practices. 3D printing is not just for Research and Development. It can be used in numerous purpose like; designing and making artistic sculptural; modeling 3D geographical terrain; modeling mathematical shapes; modeling and studying architectural and historical buildings/structures; creating moulds for food products, cells, atoms, DNA and other scientific concepts. Complex Geometries: 3D printing has the ability of creating components and parts for complex designs, without any limitation of geometric complexity. Mass Customization: 3D printing technology provides the facility of creating multiple products inside same build. Manufacturers can create various designs instead of going for different end-user requirements. Less Tooling: 3D printing reduces the number of processing steps and the amount of tooling necessity for each step. This will result in creating the ultimate product faster. Fewer Costs: 3D printing allows one to save tooling cost and reduce the necessity of equipment. It also takes less time as compared to the conventional methods, which reduces times and speeds up delivery. Environmentally Friendly: Since it has less assembly requirement, a 3D printed project/object creates less overall waste which decreases the environmental impact as compared to conventional machining methods. Student will have ability of creating complex and unusual shapes made up of additive manufact. Student will learn the economic benefit of using 3D printing technology. Student can design and print 3D models without any wastage of plastic and metal. Student will be able to design Prototypes of their designs easily without any considerable investment.